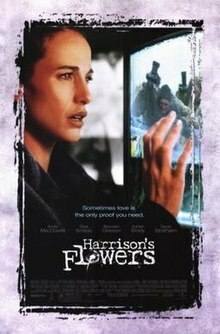 Harrison's Flowers is a 2001 French film by Elie Chouraqui. It stars, among others, Andie MacDowell, Elias Koteas, Brendan Gleeson, Adrien Brody, Marie Trintignant, Gerard Butler, and David Strathairn. The film is also Quinn Shephard's big screen debut. Universal Pictures released this film in the United States theatrically, then Lionsgate released this film in the United States on DVD. For this film's United States version, the film's length was reduced by about 5 minutes; it also features a new score by Cliff Eidelman. Harrison Lloyd, a Pulitzer Prize-winning Newsweek photojournalist, travels on his last assignment to the former Yugoslavia in 1991, during the Croatian War of Independence. While there, he is presumed to have been killed in a building collapse. His wife travels to the region to find him, believing him to be in the city of Vukovar. Travelling through the war-torn landscape, she arrives in the city, and bears witness to the massacre which took place there. Back home, Harrison's son Cesar cares for his father's flowers in their greenhouse. Rotten Tomatoes gives the film a critic score of 49% and an audience score of 76%. ^ "Universal Pictures Entertainment Portal". www.harrisons-flowers.com. ^ "Buy HARRISON'S FLOWERS DVD from Lionsgate Shop". www.lionsgateshop.com.